Presented at SJDM in New Orleans – Adrian R. Camilleri, Ph.D. This week I traveled to New Orleans to attend the 39th Annual Conference of the Society for Judgment and Decision Making. This was my second visit to NOLA. This time the weather was cold and windy – a low season for tourism. So, it wasn’t too much of a surprise when I was the only one who turned up to the bike tour I had registered for. Nevertheless, it was great to learn about the history of the city – being passed between Spain, France, and England in the early years. Of course, there was a mandatory stop to eat beignets and po-boys. I also stopped to listen to some jazz, which I do not do often enough. 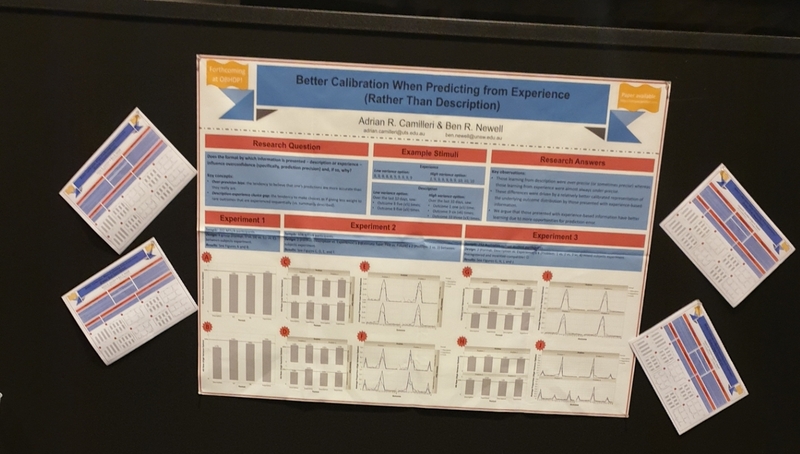 During the first poster session of the conference, I presented a poster together with Ben Newell titled, “Better Calibration When Predicting from Experience (Rather Than Description)”. This is research that has recently been accepted for publication at the journal Organizational Behavior & Human Decision Processes. As always, I had some fun conversations with visitors. A (Psychonomics) keynote address by Hal Pashler on his inability to replicate social priming studies, and a more general call to arms on the replication crisis. A keynote address by incoming SJDM president Christopher Hsee on what he calls “Hedonomics”. I think Chris does such good research and his studies are always interesting. My favorite example was the effect of uncertain incentives and making participants run up and down stairs. Luxi Shen explained how people do not like uncertainty when thinking about future prospects but do enjoy it when in the process of making decisions. John Beshears answered the question “Should Governments Invest More in Nudging?” with a convincing “yes”. Jenn Logg argued that people may actually prefer algorithmic to human judgment in some situations – algorithm appreciation! Dan Wall reminded me that narrow brackets help people learn the distribution of outcomes in the world and so may not deserve the bad reputation it currently has. Looking forward to doing it all again next year in Montreal! © 2019 Adrian R. Camilleri, Ph.D..